Create the look of old sterling silver by enhancing your finished etched project with an application of this easy to use metallic wax. It is best to use this special effect for display pieces that will not require repeated cleaning. Washing, especially in the dishwasher, will remove the brilliance of the wax, and eventually, the entire layer. 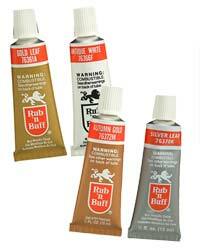 Includes four 1/2 ounce tubes: Silver, Gold, Autumn Gold (Copper), and White. Each tube covers over 10 square feet.